Recently I needed a gift for my sister-in-law and decided I wanted to give her something homemade yet sentimental. 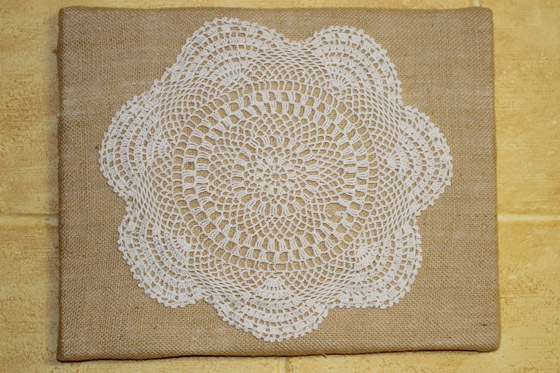 I remembered that I had some of my grandma’s hand crocheted doilies and wanted to give her one of them to display in her home. With little children, I have never found it practical to have doilies on end tables, so I decided to come up with a way she could hang the doily on her wall. 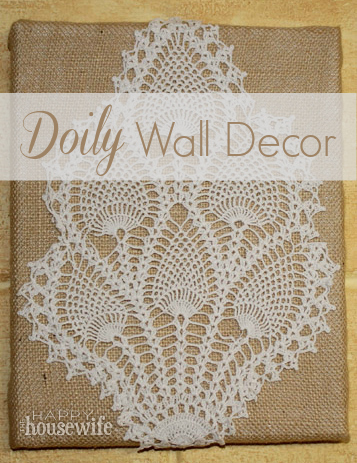 A canvas frame and some burlap turned out to be the perfect way to display the doily. This project literally took about 15 minutes to make. 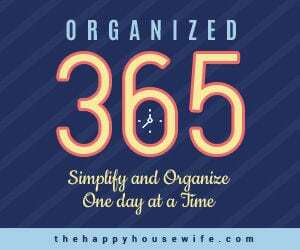 It was a frugal project too. 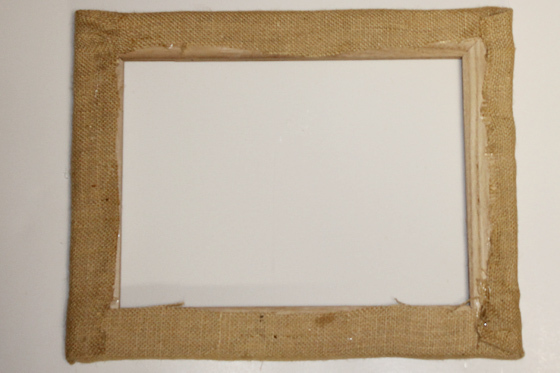 I paid 25 cents for the brand new canvas at a yard sale and used burlap from my stash. 1. 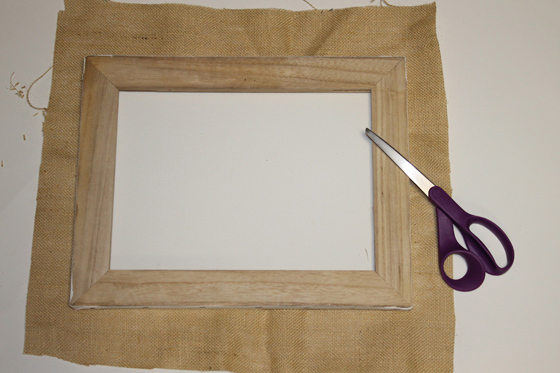 Lay the canvas on top of the burlap and cut the burlap around the canvas leaving 1 1/2 to 2 inches excess on all sides. Note: My burlap was wrinkled so I gave it a quick pressing with my iron after cutting it. 2. 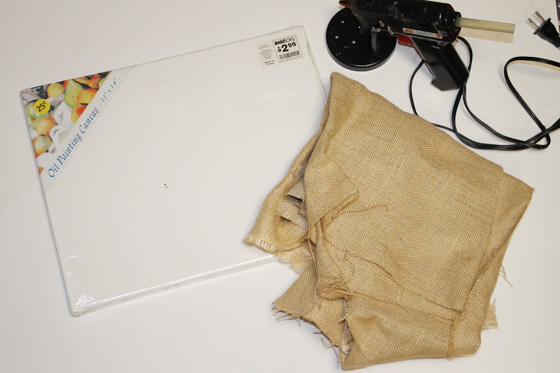 Use the hot glue gun to adhere the burlap to the back of the canvas on the wood stretching slightly as you go. Here is the how the back of the canvas looked when I was finished. 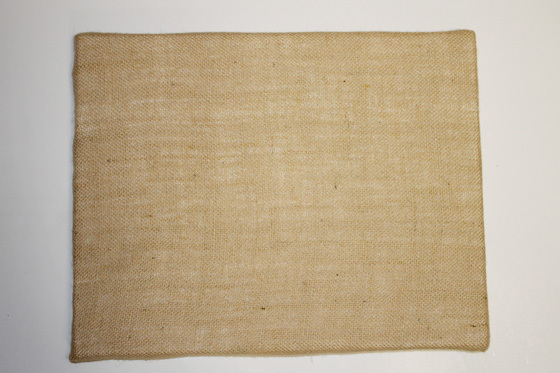 Here’s the front of the burlap covered canvas. At this point you could do anything to embellish the canvas. However, as I mentioned earlier, I wanted to put a vintage doily on mine. 3. 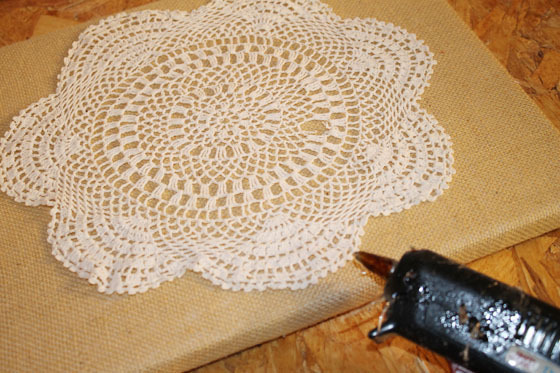 Lay the doily on top of the canvas, centering and arranging it as desired. 4. 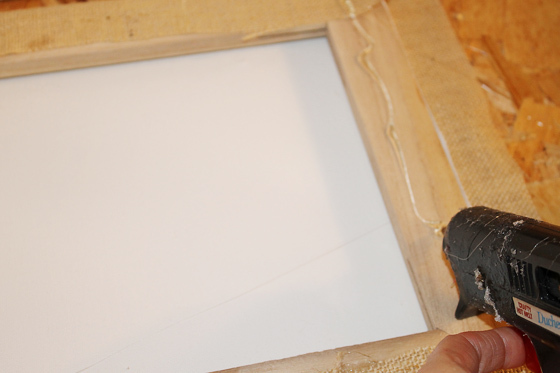 Use the hot glue gun to glue the edges to the canvas. 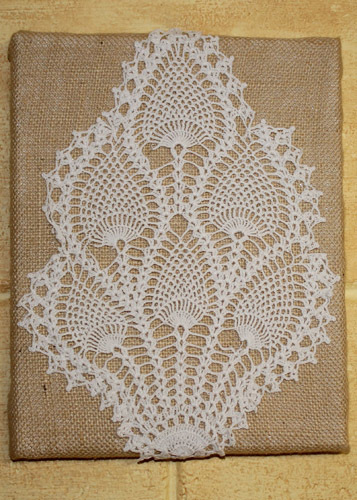 I found that lifting a small section at a time, putting a thin bead of glue on the edges, and then gently patting the doily in place was the best method. You are now ready to hang your new artwork on a nail with no special hardware needed. I used a smaller canvas for this doily. Don’t you just love the intricacies of the doilies? I am so happy to have a way to display my grandma’s beautiful handiwork. Do you have any vintage doilies? 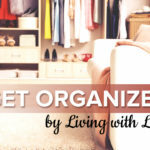 Even if you don’t you can find some at yard and estate sales fairly inexpensively.